The basilica was one church on top of another (like Lourdes sort of.) We had missed the English tour so we walked through looking at the frescoes and paintings. We made it to the tomb of St. Francis which had been opened up so that pilgrims could venerate it. I heard singing and left to hunt it down and caught consecration and the end of Mass. The guys received the St. Francis blessing and came out of the tomb soon after. After listening to the audio automatic tour, we visited the gift shop. Then we walked to a legendary interesting place Halayna had told us we should see. We walked to the very top of Assisi and then up and up to the top of the hill that Assisi was built on. There was a castle on top, but we couldn't find the legendary secret place. Sam and Chris talked to a guy about Mejagorie while Jon and I sat on the castle walls and enjoyed the view. Then back to town and a quick drive to St. Damian's, the church St. Francis had rebuilt when the crucifix spoke and told him to rebuild the church. And one final stop at St. Mary of the Angels, which had still standing within it was the Porticola, the first church of the Franciscan community--and what a humble little church it was. We saw the rose garden that St. Francis had cast himself into when he was tempted against chastity; the story is that God was pleased with his intention and preserved him by removing the thorns from the roses. And there are still no thorns on those rose bushes. 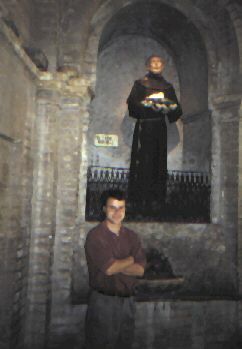 There was also a statue of St. Francis with his hands out-stretched and a dove had built its nest there. I had heard about this phenomenon two years ago from the Christendom in Rome people and wanted to see it for myself. Sure enough, there it was still sitting there in the hands of St. Francis. After a quick peek at St. Francis' room (the dimensions are under debate but since I'm writing, I'll say five feet tall, six feet wide, and fifteen feet deep. Still small by any one's standards.) Sam and I agreed that St. Francis was a total mad man for Christ. Then we pushed ever on and camped between Padua and Venice. it was a nice little campground with soft grass and hot showers. It looked like it was going to be a great night. The mosquitoes let their presence be known soon enough and encouraged us to be quick about setting up the tent. I said that I thought it was going to rain (man, what a prophet) so we put up the rain fly. We had been having a little trouble with the tent legs tipping over but I thought I had finally figured out why and explained it to Jon (our other physics expert on machinery and tork pressure systems.) He agreed we had finally achieved maximum stability. Jon and I walked to the store; I bought a big Heinekin and wrote a few letters while Jon bought Fanta and cookies and wrote letters. Chris did laundry and then he and Sam had the ping-pong championship of the world. Sam finally won 4 games to three. Eventually, we all retired in a peaceful and blessed slumber. I had tossed my backpack into the tent earlier so as to not have to deal with mosquitoes. It may seem insignificant now, but, please, read on.